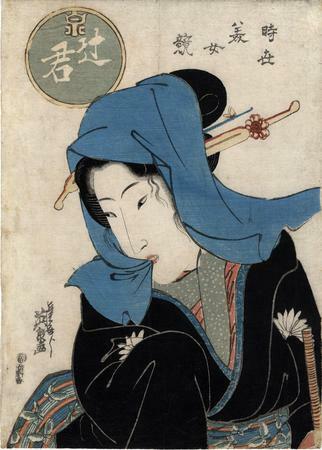 This Eisen print has a precedent/model in a design by Utamaro from ca. 1795. The connections are undeniable. Both women are wearing black robes. Not only are they both images of beautiful women, but both show a woman with a cloth covering their hair. Each of them is holding that cloth by their teeth - a motif rich in sexual symbolism obvious to the late eighteenth and early nineteenth century print buyers. Another connection is in the title and the use of the term 'tsujigimi'. In the catalogue, The Passionate Art of Kitagawa Utamaro by Clark and Asano it says: "Tsuji-gimi (literally 'crossroads girl') or yotaka ('night-hawk') were the pejorative names given in Edo to street-walkers, prostitutes of the lowest level." Clark goes on to note that the woman in the Utamaro print is too beautiful to be a low-class prostitute. The same could be said for the woman used as a model for the Eisen print shown here. We know of at least 6 prints from this series. One other point: Click on the Eisen image and enlarge it so you can see more clearly the design of the woman's obi. It shows butterflies apparently flying over a striped design which hints at flowing water. There is another copy of this print in the Shimane Art Museum. They date their copy to 1825.